Bethlehem Steel announced on Monday an agreement has been reached with Rivoli United to permanently acquire Jamaican international forward Cory Burke. 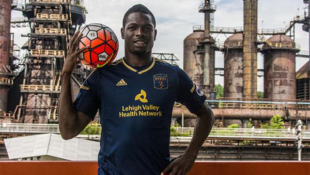 The 24-year-old spent the 2016 season on loan with Bethlehem from the Jamaican National Premier League side, scoring 4 goals and 2 assists over 1226 minutes of play in 20 appearances for the Steel, including 14 starts. On Sunday night, Burke scored the lone goal in Jamaica’s 1-0 win over Suriname in a Caribbean Cup qualifier originally scheduled to be played in October that was postponed because of Hurricane Matthew. The win advanced Jamaica to the semifinal round of the Caribbean Cup and qualified the team for the 2017 Gold Cup. Burke scored his first goal for Jamaica in the 4-2 extra time win over Guyana in a Caribbean Cup qualifier on Oct. 11. He made his national team debut in the 2-0 loss to Haiti on Sept. 6 having previously never appeared for Jamaica at the youth level. In addition to Burke, also returning to Bethlehem from the 2016 roster are Bolu Akinyode, Amoy Brown, James Chambers, Seku Conneh, Josh Heard, Matthew Perrella, and Yosef Samuel. I hope this doesn’t mean what I think it means. While it says he is permanent with Steel this may just have been the Union cheap idea of a new striker for them. Disappointing if this is the case, but I wouldn’t put it past them since they are typically cheap. I would reassure you, Dr. Union, primarily on the basis of the following. Every time I watched a Steel game live on Sunday afternoon after having watched the Union live The previous night, my first thought was how much slower the USL game was. The only time that was not true was the next-to-the-last game against Pittsburgh when for the first twenty minutes the Steel’s overtly MLS pace left Pittsburgh stunned and standing. Reinforcing your concern, however, Burke plays the position quite similarly to Sapong. He would be an emergency replacement if the first team needed an immediate injury replacement in that particular style. But you will note he is on the Steel’s roster. Moving up to the first team on a temporary basis is much more complex than going the other direction. It is a fulfledged player signing in 2016. There is no equivalent to the Major League Baseball 40 man roster and option system. Obviously that could change, but while the Steel are wholly owned by the Union, USL is not similarly owned by MLS, so such a change would be complex to achieve. Think first about the financial implications it would have for the MLS and its individual clubs, as you typically already do. Tim I would agree it is harder to move a player from USL up to loan to MLS. My worry is that this is like Tribbet lets sign him now if he wins a job over the preseason he can be our backup Sapong (with no thought toward lets sign someone of value, just pick up someone on loan like Anderson). Ultimately I want a new signing a forward. Push Sapong to the wing or the bench he is no striker for me. Kevin Kinkead wrote a piece on possible strikers to bring in and while I am unsure whether I would want a Boyd or Johannson because of injuries and such the idea of Benschop to me is an ideal target for this team if it is looking to play one up top. Benschop has more speed than Sapong, better with his feet, can make his own space if needed, is quicker to react on plays and has better movements, also think he is bigger so to me he fits the definition of what this team needs. So that brings up a question, MLS owns MLS players. Is USL set up so that USL owns USL players or is it a team by team basis. I know a lot more about the MLS set-up than how USL operates when it comes to this. I would assume that they still want the process to be fairly easy to transfer between the two leagues – this is a major reason for the affiliation to begin with right?